✅ Trip Verified | London to Chennai via Bahrain. I had booked this flights as there were almost 100 pounds cheaper as I had to travel in the next couple of days of booking. I have very little or no expectations as my previous experience with Gulf Air five years ago was worst. Boarding the flight from London to Bahrain it was a new aircraft. In flight entertainment was not the best but I can find something to keep me going for the 6 hours. Could not complain about the food and drinks on offer. As always no matter who the carrier is the connecting flight to Chennai was old, not so clean and poor service I think almost all middle east airlines feel they are running Indian routes for charity forgetting Indians are their majority customers. Overall I feel choosing this carrier is a good value for money. "baggage are left at Bahrain"
✅ Trip Verified | Riyadh to Bahrain via Hyderabad. Cabin crew service was not good, I was travelling to Hyderabad from Riyadh Via Bahrain.Firstly flight was delayed for around 3.5 hours at Bahrain, and when we visited Hyderabad and waiting for baggage, they informed that the baggage are left at Bahrain. Then ask us to fill the missed baggage form and stamp from customs etc. Then they informed us that they will receive the baggage by next Gulf air flight to Hyderabad and will be delivered to home in 24 hours. I received the baggage after 1 week after calling them continuously, and the condition of the baggage was worst out of shaped and items were damaged. "star of the flight was the food"
✅ Trip Verified | Bahrain to Jeddah. This flight was smooth from the check in process all the way to the boarding. There were too many pilgrims aboard and some of them were not able to speak English and one passenger refused to take a seat away from his wife and wanted to speak with the flight attendant while the plane was in taxi stage. The flight attendant was infuriated and literally said “oh my god” and took him to his seat. I really can’t blame her he was too much. The real star of the flight was the food which was chicken kabsah and it tasted like a quality restaurant was serving it. ✅ Trip Verified | Bahrain to Casablanca. Going direct was my main concern, that's why I paid around 600 Bahraini Dinars. Everything was ok, clean and new aircraft, seat was ok but we cannot choose the seat online from Casablanca, cabin crew were nice, helpful, but the food wasn't as expected. Really bad choice and should change the service asap. For the way back, it was worse. The choice and quality for lunch was poor. The service from Casablanca was the greatest before, as I travelled on Gf 081 and 083 long time back . 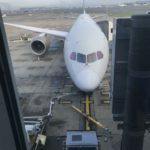 The food is not that much important for me more that the comfort of the flight itself , but i still have to talk about it as it s a long-haul flight and needs to have a look at it. ✅ Trip Verified | Riyadh to Athens via Bahrain. The worst airline I've flown. We recently took a flight with our three children from Riyadh to Athens via Bahrain with Gulf Air. 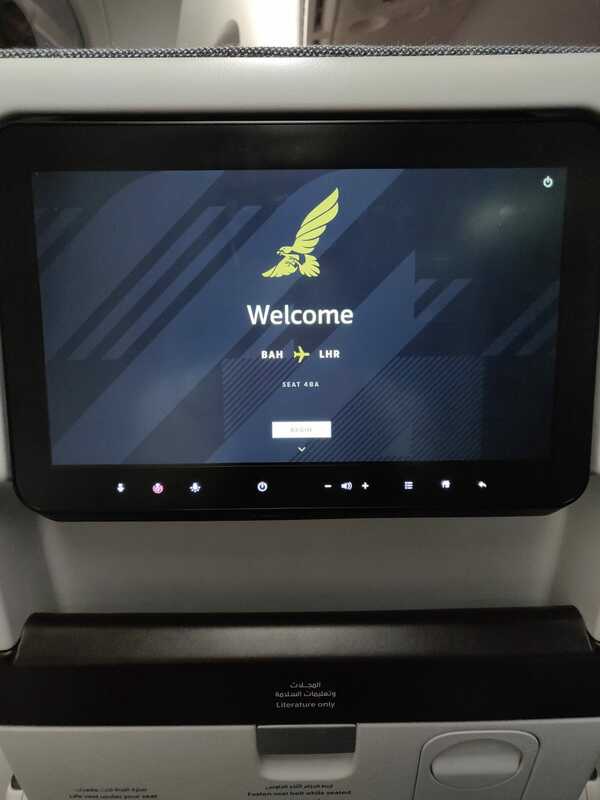 The cabin service was pretty unfriendly and just about functional but we didn't have great expectations of Gulf Air - I know they aren't in the same league as Emirates or Qatar. Upon arrival in Athens we experienced that moment every traveller dreads when the baggage carousel finishes spewing out bags, all the other passengers have gone and you are left holding just your hand luggage. We reported it to the Handling Agent in Athens who told us there was another flight arriving that night but for some reason ours couldn't be located and if it was we wouldn't get it for at least another 48 hours. Deep joy. The started of your holiday with three small children and only the clothes you are wearing and a book and half eaten sandwich for company. We then spent the next three days phoning, emailing and tweeting the airline. All to no avail. No response other than a huge phone bill with hours spent waiting on hold. Eventually our bags were delivered 4 days late to a local island but they were damaged and showing signs of mistreatment. Again - no response, apology or communication or any form from the airline. The return journey back to Riyadh was slightly less miserable and we took the opportunity speak to the airline offices in Athens and Bahrain about compensation. No surprises though when the airline said they couldn't / wouldn't help whatsoever - even complimentary lounge access for our 3 children during the 4 hour layover in Bahrain was flatly refused. In all - it's down to customer service or a total lack of, disregard and disdain for their customers and a haphazard operation. I had a similar experience with Emirates in January and by contrast they couldn't have been more helpful. No questions compensation of $250, limo from the airport and they picked up the tab for essential items that I bought whilst they located my bags. Poor show Gulf Air. A really bad service. ✅ Trip Verified | Bahrain to London Heathrow. Boarding the plane in Bahrain was a bit hectic, they had asked people to line up for boarding but boarding didn’t start until 20 minutes later, considering the fact that this was the early morning flight (around 1am) this was more of an inconvenience than seemed as people were tired. Once on the plane, the seat and entertainment system were sleek, modern, practical and functional. Soon after take off the cabin crew passed around distributing either chicken or vegetarian sandwiches, I chose the chicken, which was quite delicous. Drinks were also served, a selection of juices, coffee, tea, water and soft drinks were available. The inflight entertainment was not huge, but it was satisfactory, with a selection of different genres of movies, TV shows, games and music. The amenities that were given weren’t a lot, but it was enough (socks, eyeshades and earplugs). Aside from the visual beauty of the seat, the reclining capability was not limited and was very comfortable to sleep on, also the adjustable headrest and the soft pillow and blanket added to the comfort. I woke up for breakfast which they served about an hour to an hour and a half before landing, the non-vegetarian option included a main meal consisting of an omelette, a sausage patty, some potatoes and mushrooms in a tomato sauce, separately it wasn’t appetizing but together they complimented each other well. It wasn’t overly amazing, but it was nice. 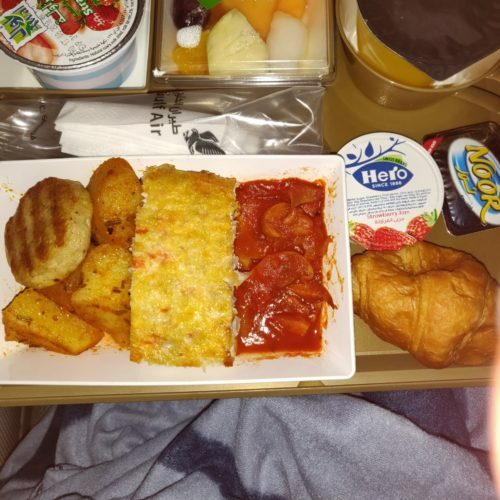 Aside from that, some yoghurt, fresh fruit, a croissant with condiments and a cup of orange juice was served, flight attendants also came around to serve drinks. 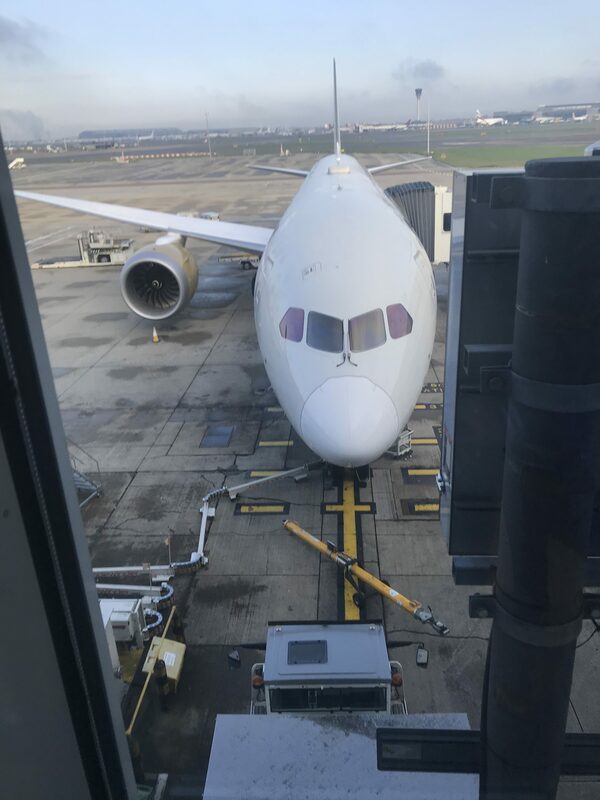 After landing in London, it took us some time to get to our gate, due to traffic and malfunctioning air bridge but that wasn’t Gulf Air’s fault. 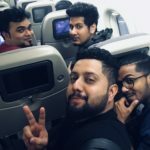 Overall, the best part of the flight would be the aesthetically pleasing design, the friendly and attentive cabin crew and the comfortable seat. ✅ Trip Verified | Frankfurt to Bangkok via Bahrain in Business Class was quite nice. This was my first time to use Gulf Air at Frankfurt airport. So, I did not realized before that the airline lounge was located outside the passenger security control. After passing immigration and security control and coming inside, I was looking for the lounge and then I noticed that there was no lounge inside here. Gulf Air use Cathay Pacific Lounge, located before security control. Frankfurt to Bahrain used A320 aircraft which it is quite small aircraft but business class seat is very comfortable. I got a welcome drink, which was a lemon mint. Sky chef came out to suggest the menu, I chose grilled seabass with lime rice and dessert was German cheese cake and fresh fruit. The meal service was very nice and I was offered white wine too. Flight hours from Frankfurt to Bahrain is about 5 hours. So, only one meal service was served - I did expect to have hot tea or coffee with some small snack before landing. When arrived to Bahrain airport, passing through quick security control at transit area, I went directly to the business class Lounge. Staff in lounge attentive. Bahrain to Bangkok the seat is very nice and large space. Welcome drink offered, I chose fusion appetizers as starter and main course was honey duck. I did enjoy Gulf Air business class meal very much. After meal service, flight attendant came out to ask if I wanted my seat to be prepared as bed. Then they adjust my seat to be a bed with mattress and bed sheet. Their in-flight entertainment is nice, a lot of movies and musics, also games and information. About 1.50 hours before landing, flight attendant woke me up for breakfast which I was offered for fresh fruit, croissant, hot tea and juice. I was really satisfied for Gulf Air business class class. 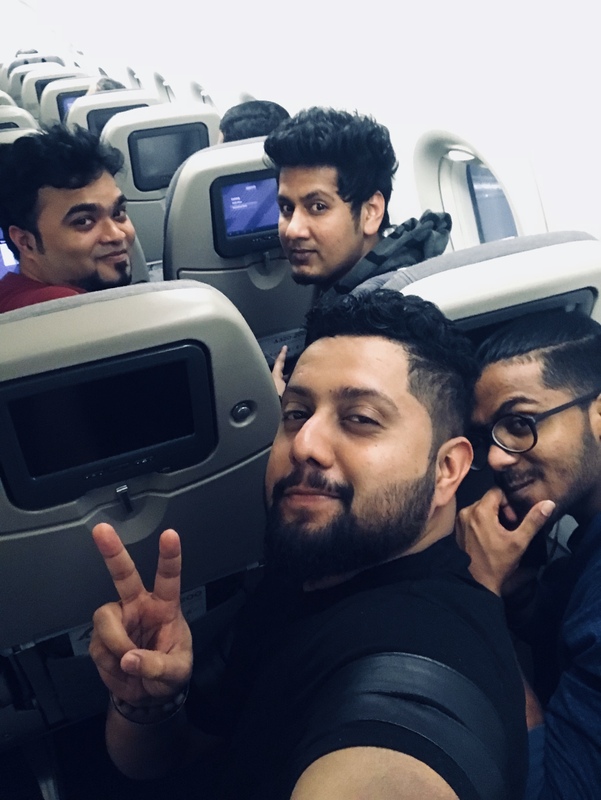 "definitely fly with them again"
✅ Trip Verified | Bangkok to Frankfurt via Bahrain was a really pleasant experience. I got a very warm greeting from the flight attendant when entering the aircraft and selection of welcome drink, I choose champagne. The Sky Chef came out to offer the lunch menu and drink. I choose Cod fish and Italian dry white wine, which was very good. I have to say that the meal was beyond my expectation. Flight attendant was very attentive, often came to fill up my wine and very nice personality, asking me if I did enjoy the flight or not. When arrived to Bahrain, I used the Falcon Gold lounge waiting for my next flight to Frankfurt. The lounge is large, choices of meals and drinks. Meal in the lounge taste quite good. I took beef stew and deep fried chicken. Drinks, a lot of choice from juice to beer, wine and champagne too. Again flight from Bahrain to Frankfurt. They use smaller aircraft (A320) but seat is comfortable and large space. Since it was a late night flight. So, I was serve only light meal and choose Garden Salad and drink champagne. I think that it was nice salad and meal was not too much for late night flight. 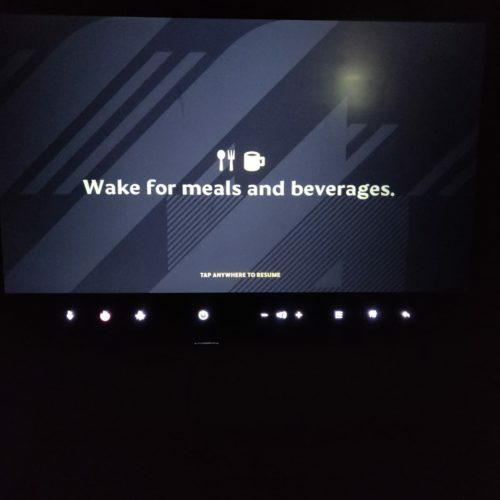 Breakfast was served 1 hour before landing. I choose omelet and hot coffee. Seat on Falcon Gold is very nice and comfortable. I have looked for my next trip to Frankfurt in November and I see that Gulf Air will change aircraft from A330 to B787 which B787 has new modern seat configuration too. 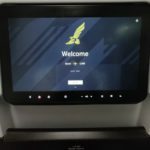 Base on some negative review of Gulf Air which I read before, first, made me quite unsure about to fly with them but I would definitely fly with them again. "jump in the right direction"
✅ Trip Verified | London to Bahrain. I'm a regular on the LHR-BAH route but this was the first time on the 787. A huge improvement generally compared to the A330, and that certainly wasn't bad. It's very quiet and smooth, and the new staff uniform is very smart. The seat is excellent and all-aisle access is a good move. The handheld IFE controller is a down point though, not very intuitive how to use it. 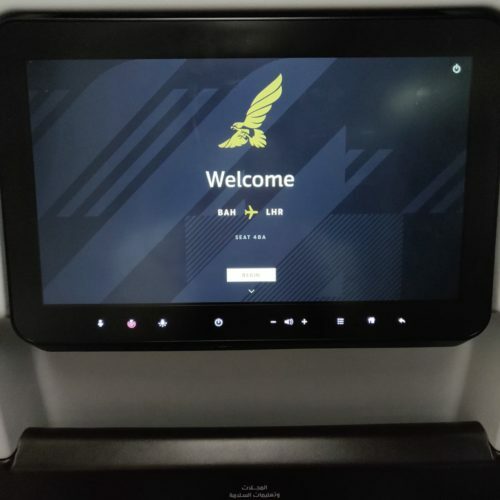 In fact, IFE generally is a miss... the screen is massive and high quality, but the film and TV selection is small, and seems to just be lifted from the A330, a big miss to upgrade this. Gulf Air food is normally very good but on this flight it wasn't great, with a dry prawn salad and a massively overcooked beef dish. However, I think this is a one off that I can forgive based on history. Little things matter, so for the first time I've seen on a GF flight, they handed out landing cards whilst en route - just made arriving a bit simpler. So overall, a big jump in the right direction, but don't waste the excellent IFE screen with poor content.